Could Protein Shakes Harm Your Health? For many people trying to get in shape or bulk up quickly, protein shakes are part of a daily workout regime. Protein drinks are being advertised as a way to boost fitness, and that marketing targets everyone from body builders to teenagers. But, according to a new study, over-consuming some of those products could be dangerous. "Early Show" Consumer Correspondent Susan Koeppen takes a look at an investigation being released Monday by Consumer Reports. Though manufacturers and salesmen say that these products are safe, the new study says some protein drinks may cause health problems over time. The investigation found some contain things like arsenic, cadmium, and lead. CBS News took a hidden camera to nutrition stores in New York City asking about these supplemental drinks, but not one sales person warned about possible health risks. Some said taking more than recommended doses wouldn't hurt. But trainer/dietician Erin Palinski says, not so. "They're actually going to harm their health if they do excessive amounts," said Palinski. Experts say too much protein can lead to dehydration and digestive problems, increase your risk for osteoporosis, and for some people, cause kidney problems. And now, an investigation appearing in the July issue of Consumer Reports finds that some protein drinks could be toxic, if you take too much. Says CR's Urvashi Rangan, "We tested about 15 different types of protein drinks. ... And we actually looked for four different heavy metals. We looked for arsenic, cadmium, mercury, and lead." Test results found heavy metals present in all 15 drinks -- some more than others. Urvashi Rangan, Consumer Reports, said, "What we're concerned about here is the chronic low level exposure of a heavy metal. And what people should know, is that heavy metals, once they come into our bodies, once they're metabolized, they tend to stay there for a long period of time." The supplement industry disputes claims that protein shakes could be harmful. Andrew Shao, of the Council for Responsible Nutrition, says, "The results of this analysis aren't alarming. The heavy metals that were found are well below the limits FDA (Food and Drug Administration) would be concerned about, so they don't pose a health risk to consumers at all." 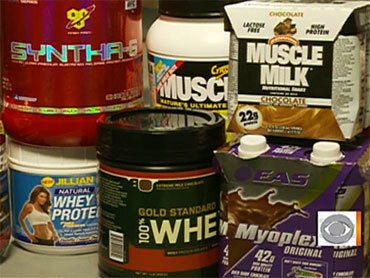 But Consumer Reports says there is little regulation requiring manufacturers to prove their protein drinks are safe. "We think the FDA should be tracking these products better," says Rangan, "and that is not happening at this time." The manufacturers of those three products say independent testing shows their products are within government safety standards even if taken three times a day.